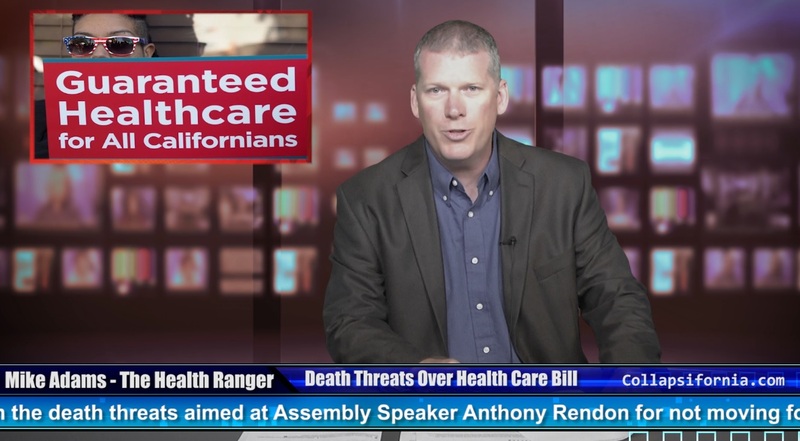 (Natural News) Some voters in California are so adamant about demanding more free stuff from the government that they’ve resorted to threatening to kill legislators who don’t back massive “nanny state” entitlements such as free, unlimited health care for all California citizens. State lawmakers recently attempted to push through a new law that would have provided free, unlimited health care for everyone — including illegal non-citizens — at a cost of over $400 billion per year. This, of course, is larger than the entire state budget and would have immediately bankrupted the state. So legislators were forced to pull it. That’s when they began receiving death threats from angry left-wing voters who think that government should give them everything they want or need… at no cost to citizens, of course. All this helps explain why I now call the state Collapsifornia, and I sincerely hope that the Left Coast fringe will split off into its own collapsing state while the rest of California restores fiscal sanity and liberty to the region. Jerry Brown is essentially a communist who promotes centrally planned economies while destroying liberty, and the California bureaucracy is so hopelessly infested with statists and communists that there’s no saving the state from its own debt collapse (financial suicide). Previous :North Korea’s nuclear missiles can now reach New York City, Boston and Los Angeles, analysts conclude… are you awake yet?